I never saw Geoff Edrich play cricket, but from my earliest years as a cricket follower his was a name that interested me. I remember as a youngster being told the story of the innings against Frank Tyson that I will mention later, but as much as anything the source of my curiosity was the simple fact that he was one of four brothers to have played the game at First Class level just after the war. Anyone with a feel for the history of the game has heard of older brother Bill, and indeed cousin John from a later generation. But few now recall the eldest brother Eric, and Bill’s younger brothers Geoff and Brian. With the greatest respect to them Eric, who played for Lancashire with Geoff, and Brian who played for Kent and Glamorgan, they were honest journeyman who would never have troubled the Test selectors. Geoff too failed to ever make an England squad, but at times he cannot have been far from a call up, particularly against South Africa in 1951. The brothers’ father was a farm manager and in 1935 returned to Norfolk to take up a position there. Initially Geoff, by then rising 17, worked on the farm. His main leisure activity was his cricket and he impressed sufficiently to earn a professional contract with Norfolk for the summer of 1937. For the next three seasons he played minor county cricket with enough success to, at the end of 1939, a summer in which he took a half century from the touring West Indians, receive an offer to join Hampshire. The War scuppered that one however. Geoff was conscripted into the Royal Norfolk Regiment not long after war was declared. One of his early duties was with an anti-aircraft guard that kept watch over the Royal Family at Sandringham at Christmas 1939. Whilst a serving soldier he married in early 1940 and he and his wife Olga had one son. Sadly for his family in 1941, by then a Platoon Sergeant, Geoff was posted to the Middle East. Whilst he was en route the Japanese attacked Pearl Harbour, and the Norfolks troopship was diverted to Malaya where, in January, they were immediately drafted into the Pacific War. The Norfolks fought hard and held up the Japanese for a time, but eventually they were forced to burn their equipment and retreat back to Singapore Island where they were when the surrender came. Geoff had lost a third of his platoon, but there would doubtless have been many occasions in the coming years when it must have seemed as if the fallen were the fortunate ones. By the middle of 1942 a large number of British and Australian prisoners were gathered at Changi. The early months of captivity in 1942 were Spartan to say the least. Conditions were not good, and there was little food, although in comparison with the way the prisoners were treated later on things were civilised enough. Medical supplies were almost non-existent however, at one point Geoff having to trade his wedding ring with a Japanese guard in order to acquire a small quantity of quinine with which to treat himself and others who were suffering from malaria. Early on some cricket kit appeared from somewhere, and there was a sports ground at Changi, and a matting wicket. The prisoners had time off every Sunday and cricket was played. Before long the Australians and the English split down traditional lines and the Australians fielded a side under the captaincy of Test wicketkeeper Ben Barnett. Five ‘Test’ matches were played, often with 4,000 to 5,000 men cheering their sides on in front of the somewhat perplexed Japanese guards. It was a strange sight to the Japanese, but they let the prisoners get on with it. The wicket was far from perfect, and conditions were hot and humid. England won two matches to one, with two games unfinished. One obituary states that there were three Tests and that Geoff scored a century in each one. The truth was rather less ‘Boy’s Own’ but Geoff was one of England’s leading batsmen nonetheless with, on his account, a high score of 65. The famous cricket journalist EW ‘Jim’ Swanton initially mistook Geoff for brother Bill, already a seasoned Test player, and was struck by the similarity of their appearances and techniques. As for Barnett years later he wrote; it was obvious that Geoff was a top-class player, and his splendid batting gave a lot of pleasure to the many prisoners who watched those games. Unfortunately those ‘Test’ matches were the only ones that Geoff got to play in, whether wartime or when peace finally returned. Later in 1942 Geoff, and everyone else capable of doing so were moved from Changi and taken to work on the construction of the Burma/Thailand railway. There was nowhere there where cricket could be played, even if the regime were anything other than work seven days a week with very little food. Somehow Geoff had the mental and physical reserves to survive the dysentery, cholera and ulcers, but by the end of the war he was still barely seven stone in weight. Having survived his time on the railway, no mean feat in itself, Geoff was then put on board one of a convoy of fifteen ships that were going back to Japan to take the prisoners to work in the mainland shipyards. Twelve were sunk by US submarines before, finally in August 1945, whilst on Honshu Island, US planes finally dropped food and clothing on the prisoners. Three months later and Geoff was back in Southampton and in the Army Welfare Department offices. There was no happy homecoming for Geoff. Olga had been receiving a widow’s pension for two years and her life and that of her son, who had no memory of his father, had moved on. Initially Geoff had to stay with his parents, and he remained there for a year. There was a happy ending to that aspect of the story, the couple eventually reuniting. Theirs was a marriage that in the final analysis endured for some 64 years. At 27 therefore Geoff was back with his parents on the farm. The fresh food and opportunity for physical work slowly brought him back to health and turned his mind once more towards the possibility of making a career in professional cricket. Hampshire were no longer interested but the President of the Norfolk club, distinguished former player Michael Falcon, effected an introduction to his opposite number at Lancashire. The Red Rose resources were seriously depleted after the ravages of war and not only did the club offer Geoff a contract, they also offered one to 31 year old Eric. There was a feeling on all sides that after what Geoff had gone through since 1941 that he shouldn’t embark on this new career alone, and Eric was only too happy to spend three years with Lancashire. At the end of the third year he was offered less favourable terms than the other professionals and, in modern parlance, ‘spat the dummy’, although he later expressed some regret at that. A wicketkeeper batsman he was never a regular in the first team, but had his days in the sun, most notably a ‘Roses’ century, and he left the county with the best wishes of all it’s supporters. His job supporting his younger brother was done too, Geoff by then being firmly established. Geoff joined Lancashire as a batsman. Before the war he had looked like developing into an all-rounder. He took his fair share of wickets for Norfolk, apparently bowling in much the same manner as his distinguished older brother. Bill could not really be described as an all-rounder, but did on occasion open the bowling for England in his younger days. He was distinctly quick with an idiosyncratic slingy action and Geoff was sufficiently similar to cause Swanton’s initial belief when he saw him bowl that Bill had arrived at Changi. After the war however Geoff only bowled 131 overs in his entire career, almost half of those on a Commonwealth XI tour of the sub-continent in 1953/54. He only ever took two wickets in England, both in 1953. Despite being a professional cricketer in 1946 Geoff was still then classified as 20% disabled, and clearly his fast bowling was a permanent casualty of his period in captivity. Geoff’s knees were less strong than they should have been, and often troubled him after a day in the field, and damage to his shoulder meant that he had problems throwing, and was a poor outfielder as well. Not that that mattered very much, as the speed of his reactions was undimmed, and with Ken Grieves and Jack Ikin was, in the early 1950s, a member of one of county cricket’s great close catching cordons. The main part of Geoff’s job description was top order batsman. His main characteristic was a refusal to give his wicket away cheaply. He was mainly a back foot player, and raw courage was his stock in trade. Nothing a fast bowler could throw at him could possibly compare to the privations he had had to endure during the war. His first summer saw him come close to a thousand runs, and in the vintage summer of 1947 he had his best summer ever in terms of average, 44.06. It was nothing like the remarkable summer that Bill had, as he scored more than 3,500 runs on his own, but it showed the sort of consistency Geoff was capable of. Despite most of his memorable performances being gritty displays when his side was in trouble, as his experience grew so did Geoff’s range of shots. His highest score was an unbeaten 167 at Trent Bridge against Nottinghamshire in 1954, and in the second he added an uncharacteristically brisk and aggressive 84 as Lancashire attempted a run chase. One of the innings that defined Geoff was against the South African tourists in 1951. He scored seven hundreds that summer, and the one against the Springboks was the one that he treasured most of all. The visitors won the toss and batted at Old Trafford and declared their first innings on 403-7. Lancashire made a strong reply and Geoff was in at first drop. He had got to 60 when he was struck on the head by a bouncer from the very fast Cuan McCarthy. Geoff had to go off for treatment but after half an hour three more wickets had fallen so he went back out.He clearly wasn’t at his best, but he battled on to 121 and Lancashire took a first innings lead. As Brian Statham was to write later Geoff possessed the outstanding characteristic of all the Edrich family – he had guts, guts and more guts. Nobody got his wicket lightly. If that century against South Africa was Geoff’s own favourite the innings that defined him was played a couple of years later against Northamptonshire, again at Old Trafford, in August. The wicket was not a good one and a youthful Frank Tyson, rejected by his native county a few years previously had a point to prove. Lancashire won the toss, batted and struggled to 163. Northants managed a first innings lead of 14. Shortly afterwards Lancashire were 13-3, and Tyson had taken all three. Statham expressed the view that it was the only occasion in England when the pace of the Typhoon approached the peak it was to reach in Australia in 1954/55. Tyson himself wrote ; It was the closest I have ever come to killing a batsman. Ball after ball lifted off a length and whistled over the batsman’s head. Early on in Geoff’s innings a Tyson thunderbolt broke his hand. His side in crisis Geoff decided to bat on. Tyson continued; This was open defiance, and I really let the next one go. By the close Lancashire were 94-7, with Geoff unbeaten on 59. There had been more blows on the hand one Northants player telling Stephen Chalke many years later that it looked like it had been hit repeatedly with a two pound hammer. Next morning Geoff had his bat knocked from his hand on one occasion, but he battled on and was unbeaten on 81 when the Lancashire innings closed. The story goes on, and the denouement is that despite a fine spell of bowling from Statham the last Northants pair crept home to bring the county its first ever win in Lancashire. At the time the East Midlanders’ victory was the big talking point, but as the years have passed Geoff’s truly heroic innings is what is remembered. A modest man he had a tendency to downplay his effort when asked about the match, but the best measure of that is that at a time when cricketers were much more likely to play through injury than they do now, Geoff did not play again that season. Between 1951 and 1953 Geoff averaged more than 40 each summer. That may not sound particularly impressive by modern standards but under the playing conditions of the time it certainly was. Only five other men managed the same consistency, and they are an impressive list of names; Peter May, Reg Simpson, Cyril Washbrook, David Sheppard and Len Hutton. The only overseas tour that Geoff went on was to India in 1953/54 with a Commonwealth side captained by his old wartime opponent Ben Barnett. Geoff played in three of the five ‘Tests’. He enjoyed no great success in those, but over the tour as a whole he did well enough and his average topped 40 again. After that however there was a decline, although in 1956, his final full season, he demonstrated another talent. In 1954 Lancashire had appointed their first professional captain. 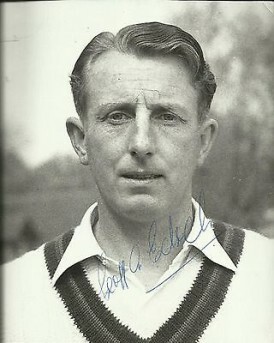 Cyril Washbrook was a fine batsman, but an essentially defensive captain. He was also a strict disciplinarian and did not have much of a rapport with his senior players let alone the youngster who were coming through. In 1956 there was a surprise call up to the England side for Washbrook, one of the selectors, so he missed ten championship matches. Geoff was his deputy and six of those matches were won. Of the other four one saw only three hours play anyway, and in the other three first innings points were secured, an important consideration in the scoring system of the 1950s County Championship. Geoff was not at all like Washbrook. He wanted to win and in one match made two declarations which enabled Leicestershire to be beaten without a Lancashire wicket being lost. By 1957 Geoff didn’t figure in the first team plans so he was appointed captain of the second eleven. He was enormously popular with his young charges who admired his fighting qualities and enthusiasm as well as his man-management skills. He also stood by the youngsters and it was that loyalty that, after two years, contributed to his losing the job. During an away game there was a problem in a Birmingham guest house. Three players got back late. A cistern overflowed and the players concerned, who had summoned Geoff for assistance, had some difficulty in sorting it out. What they didn’t know was that the leaking water had caused some damage in the room beneath. The proprietor of the establishment made a complaint to the club. The committee demanded from Geoff the names of the culprits. He declined the request and was dismissed, a remarkable sacrifice that speaks volumes for Geoff’s integrity. Another factor that wouldn’t have helped was that around three weeks before the guest house incident Geoff had been up before the magistrates and lost his driving licence. He was not a big drinker, and he was pulled up by a police officer on a bicycle at the end of his journey rather than being stopped whilst driving. The drink driving laws in England back then were rather different from today. There was no intoximeter to measure the concentration of alcohol in his breath, and even the old pass or fail breathalyser test was more than a decade in the future. Geoff was examined by a police doctor whose evidence was critical. His first mistake was that he didn’t exercise his right to call upon his own doctor, and his second was to plead guilty. In those days there was a right to trial by jury for drink driving, and it seems deeply improbable that a Lancastrian jury would have found such a popular figure as Geoff guilty had there been any doubt. On the field Geoff was a firm believer in walking, and his attitude to the case mirrored his attitude to the game. If the police doctor said he was unfit to drive then that was good enough for Geoff. What made matters worse was that the dismissal was a summary one. Geoff didn’t even get until the end of the season. Returning home to Norfolk Geoff was profoundly depressed for some time, and only thanks to Olga having a hairdressing business was financial disaster averted as well. Slowly however Geoff picked himself up and for 1960 the 41 year old earned himself a three year contract with Workington in the North Lancashire League. The League was not one of the strongest, and rarely attracted the big names and despite his fitness not being all it might have been for the two years he spent with the club Geoff topped the Leagues averages. He also played regularly for Cumberland in the Minor Counties Championship, including what must have been a satisfying return to Old Trafford even if his side did lose by three wickets – Geoff scored 47 and 52 and received a warm welcome from his former teammates. Two years into the contract Geoff was recommended for the post of coach/groundsman at Cheltenham College. The club were happy to release Geoff from the final year of his contract and he and the family moved to the Gloucestershire town where Geoff found happiness once more and spent the rest of his days. The circumstances of his parting from his adopted county always troubled Geoff and he never quite got over it, his being made an honorary vice-president many years later only partially healing the wounds. In later life the fickle finger of fate still hadn’t finished with Geoff in retirement, and he was diagnosed with cancer of the throat, something he fought with all the tenacity with which he faced the likes of McCarthy and Tyson. He ended up being unable to eat solid food for his last nine years, but he outlived many of his contemporaries. Geoff was 84 when he died in 2004.